by Bernard Mayer. Jossey-Bass, 2009. Some conflicts are so deep, complex and enduring that they are not going to be ‘resolved’ or even ‘managed’ in traditional ways. In these cases, what is called for is not a third-party consultant or mediator to help ‘solve’ the conflict but a mutual acknowledgement of the ongoing nature of the conflict and a willingness to engage the conflict constructively and strategically over time. This book’s outline begins with an analysis of the challenges and opportunities of enduring conflict and how to help disputants understand the nature of this type of conflict. The first step in constructive engagement is to minimize the biggest obstacle: conflict avoidance. From there, tools include altering the conflict narrative, focusing on durable and functional communication, and understanding and managing power differentials. 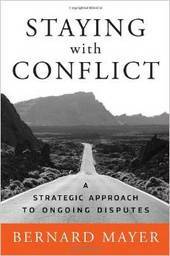 Subsequent chapters address the role of negotiation and agreements in enduring conflict, and the emotional needs of people engaged in a long-term dispute. Finally, the book closes with a discussion of the role of outside consultants. Bernard Mayer is a mediator, trainer, facilitator and writer, with experience in negotiation and dispute resolution. This book will be helpful to any leader engaged in complicated or long-term conflict.